Home / news / politics / Nigeria Presidential Debate Anchor, Mark Eddo - Who Is He & Why Him? Nigeria Presidential Debate Anchor, Mark Eddo - Who Is He & Why Him? Nigerians were greeted with unfamiliar face yesterday, Saturday 19th January, 2019 as 2019 Presidential Debate took place in Transcorp Hiltop, FCT Abuja which not surprising though, President Buhari of the ruling APC and Presidential aspirant of the PDP, Atiku Abubakar boycotted. The unfamiliar face is the anchor of the presidential debate. He is Mark Eddo! According to his bio, he is an international journalist and CEO of Mark Eddo Media Ltd. Mark is the son of a Nigerian engineer and a British nurse and according to reports, he grew up in both Lagos and London. Between 2006 and 2009 Mark was the Senior Correspondent Business and Economics for ITV News in London. On most week nights Mark joined Sir Trevor Macdonald on the News at Ten and kept ITV’s 5 million regular viewers informed on all the major business stories. Before ITN, Mark spent 4 years working as a presenter and reporter at the BBC in London. 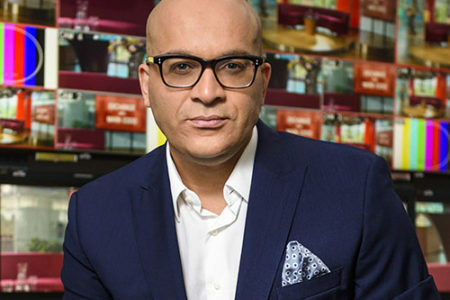 He regularly hosted ‘World Business Report’ on BBC World. Mark provided BBC reports from Asia, South Africa, the USA and the Middle East. Until March 2012, he continued to work for the BBC as the roving reporter for BBC World’s Africa Business Report. Mark has also reported for Al Jazeera, CNBC, MSNBC, NBC in San Francisco and The Wall Street Journal TV in New York.